“Right now, we have about ninety per cent or ninety-five per cent of the technology we need,” Mark Jacobson, a professor of civil and environmental engineering at Stanford, told me. In a series of papers, Jacobson and his colleagues have laid out “roadmaps” to a zero-emissions economy for fifty states, fifty-three towns and cities, and a hundred and thirty-eight other countries, with a completion date of 2050. Just as in the Democrats’ Green New Deal, the central element... is converting the electric grid to clean energy by shutting down power stations that rely on fossil fuels and making some very large investments in wind, solar, hydroelectric, and geothermal facilities. 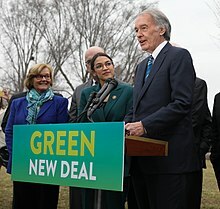 Progressive organizers are mobilizing behind the Green New Deal resolution—unveiled last week by Rep. Alexandria Ocastio-Cortez (D-N.Y.) and Sen. Ed Markey (D-Mass. )—with renewed energy to build "an unprecedented political coalition" to radically transform the nation's energy system and address the climate crisis while also facilitating a just transition to a new, greener economy. Organic Consumers Association international director Ronnie Cummins described it as "The only solution that matches the scale of our multiple crises, including global warming, corporate control of our food system, income inequality, and the general decline of our environment and our democracy..."
When we talk about the concern of the environment as an elitist concern, one year ago I was waitressing in a taco shop in Downtown Manhattan. I just got health insurance for the first time a month ago. This is not an elitist issue; this is a quality-of-life issue. You want to tell people that their concern and their desire for clean air and clean water is elitist? Tell that to the kids in the South Bronx, which are suffering from the highest rates of childhood asthma in the country. Tell that to the families in Flint, whose kids have—their blood is ascending in lead levels. Their brains are damaged for the rest of their lives. Call them elitist... People are dying. And with respect to our brothers and sisters and neighbors that are in agriculture, bring them to the table. Let’s hold hearings. Let’s add provisions. Let’s amend the legislation to accommodate for the just transition and for the encouragement of those industries to grow. And I would also encourage, to my colleague on the other side of the aisle that thinks we’re trying to ban cows, to actually read the resolution and understand that there’s nothing to that effect in the legislation, and not only that, but we’re trying to invest in these communities and our agricultural workers, so that they can enjoy prosperity into the next century. Specifically, the resolution says it is the duty of the federal government to craft a Green New Deal “to achieve net-zero greenhouse gas emissions”. That includes getting all power from “clean, renewable and zero-emission energy sources”... The document also endorses universal healthcare, a jobs guarantee and free higher education – a huge shift in messaging from nearly a decade ago, when Democrats were advocating for a cap-and-trade system to limit greenhouse gases by allotting industry permits for pollution. The Green New Deal is wildly popular among both Republican and Democratic voters, as HuffPost previously reported. Still, Republican lawmakers have been quick to dismiss it as a “top-down” and “impossible” proposal. The Trump administration’s relentless push for so-called “energy dominance” includes plans to massively expand offshore oil and gas drilling. And an internal document that surfaced last year suggested the National Oceanic and Atmospheric Administration, the nation’s leading ocean science agency, is planning to gut protections for America’s marine national monuments, opening millions of acres of federal water to commercial fishing. Ocean conservation nonprofit Oceana is among the many groups that celebrated the introduction of the Green New Deal last week. Protecting oceans, as the resolution calls for, is a “no-brainer,” Beth Lowell, the group’s deputy vice president U.S. campaigns, told HuffPost... “By rebuilding ocean abundance, we can help the coastal communities and fisheries that rely on healthy oceans for generations to come,” she said. A large-scale effort to protect and restore wild spaces would be a grand departure from the last two years, when the Trump administration slashed protections for 2 million acres of national monument land in Utah, offered up millions of federal acres for oil and gas leasing, some of which sold for as little as $1.50 per acre, and prioritized opening Alaska’s fragile Arctic National Wildlife Refuge to fossil fuel development. A press release put out by the Interior Department last week, titled “Energy Revolution Unleashed,” touted a record $1.1 billion in oil and gas lease sales last year... It is time the federal government end its practice of leasing lands for fossil fuel production at below market value, and instead explore boosting renewable energy development that helps protect ecosystems, species and indigenous lands. Starting with a visit by...young climate activists to Sen. Dianne Feinstein’s Bay Area office...Their exchange — about whether the California senator would vote for or co-sponsor the Green New Deal...went viral. It led to a turbocharged debate about whether the video had been edited, but it also brought with it a tangible change in the halls of Congress...In her now-infamous response, Feinstein said she was in the process of drafting her own, more moderate resolution on confronting climate change that she felt would have a better chance of passing in the GOP-run Senate. The group of young people, who ranged from 11 to 24, were from several different climate action groups. The viral Twitter clip has racked up more than 9 million views, and was the first time many people had heard of Feinstein’s alternative resolution, and when climate activists learned about it, they went into overdrive to stop it. Feinstein, facing pressure... elected to shelve it. On Monday (25 Feb 2019), the Sunrise Movement in the form of roughly 250 Kentucky high schoolers, occupied McConnell’s Senate office, resulting in 35 arrests. Some protesters held up a banner that read “Mitch, Look Us in the Eyes,” while others lined the halls outside his office... While the sit-in got little attention in the press, it appeared to have gotten McConnell’s. The majority leader, who is up for re-election in 2020, had recently been eager to put the Green New Deal on the Senate floor. All of a sudden, however, he suggested that it would come up at some point before the August recess. “I really don't like their policies of taking away your car, taking away your airplane flights, of ‘let’s hop a train to California,’ or ‘you’re not allowed to own cows anymore! 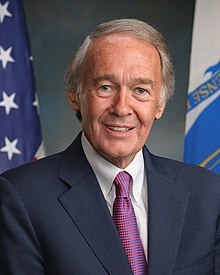 '”...bellowed President Donald Trump in El Paso, Texas, his first campaign-style salvo against Rep. Alexandria Ocasio-Cortez and Sen. Ed Markey’s Green New Deal resolution. There will surely be many more. It’s worth marking the moment. Because those could be the famous last words of a one-term president, having wildly underestimated the public appetite for transformative action on the triple crises of our time: imminent ecological unraveling, gaping economic inequality (including the racial and gender wealth divide), and surging white supremacy. There is a grand story to be told here about the duty to repair — to repair our relationship with the earth and with one another, to heal the deep wounds dating back to the founding of the country. Because while it is true that climate change is a crisis produced by an excess of greenhouse gases in the atmosphere, it is also, in a more profound sense, a crisis produced by an extractive mindset — a way of viewing both the natural world and the majority of its inhabitants as resources to use up and then discard. I call it the “gig and dig” economy and firmly believe that we will not emerge from this crisis without a shift in worldview, a transformation from “gig and dig” to an ethos of care and repair...The Green New Deal will need to be subject to constant vigilance and pressure from experts who understand exactly what it will take to lower our emissions as rapidly as science demands, and from social movements that have decades of experience bearing the brunt of false climate solutions, whether nuclear power, the chimera of carbon capture and storage, or carbon offsets. But in remaining vigilant, we also have to be careful not to bury the overarching message: that this is a potential lifeline that we all have a sacred and moral responsibly to reach for. It’s no accident that this Green New Deal has been championed by a legislator not yet 30. It’s Ocasio-Cortez’s generation who’ll bear the full brunt of the results of three decades of legislative inertia on climate change. All of us owe it to her generation and future ones to ensure that the political and economic choices she and others face in 20 years won’t be even worse because of our failure of leadership, nerve and imagination today. Timely support of this bold new deal, and the principles it stands for, may in fact be our only hope. When your #GreenNewDeal legislation is so strong that the GOP has to resort to circulating false versions, but the real one nets 70 House cosponsors on Day 1 and all Dem presidential candidates sign on anyway. The Green New Deal seems to have driven the Republicans as crazy as its primary proponent in the House does... 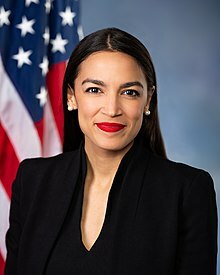 In El Paso, for example, the president... told his gathering of bot-minded fans that AOC plans to ban automobiles, airplanes, and cows... Mitch McConnell has decided again to be... clever... and put the proposal up to a vote, figuring that it somehow puts Democratic candidates in a bind... GND is wildly popular among the people who will be voting for the next 40 years. The GND forces on people two realities with which their 30 years of climate denial has managed to insulate them. First, the problem is so severe that it is going to require a massive national response even to mitigate the effects of the crisis which are affecting us now. (This is why the Pentagon has taken the crisis as an existential one.) Second, the denial argument itself is completely out of steam. We are in the process of utterly wrecking the planet by burning fossil fuels and thereby raising Earth’s temperature. We are now experiencing higher temperatures than in any decade of the past 10,000 years, and the temperature continues to rise. As a result, humanity faces the risk of a catastrophic multimeter sea level rise at the current or slightly warmer temperature...The Green New Deal... endorses the science... As with every great engineering challenge our nation has faced — the Erie Canal, the 20th-century power grid, the Interstate Highway System, the civil aviation system and the moonshot — we need bold timelines, clear milestones, breakthrough engineering and public-sector leadership. No doubt, when properly regulated and guided by engineering plans, the private sector will do its part with excellence and timeliness. Activists have made it clear — politicians can get on board with the Green New Deal or “fade into oblivion.” ...As a blueprint for collective action on climate change, the Green New Deal has attracted a great deal of enthusiasm... The proposal raised eyebrows with its ambitious 10-year plan to cut carbon emissions by 2030, transition to renewable energy sources, and invest heavily in job creation and infrastructure... It amounts to nothing short of a wholesale transformation: The Green New Deal framework rests on the idea of a just economy... The resolution... focuses holistically on the right to a clean and sustainable climate. It emphasizes the effects of climate change on frontline and vulnerable communities and recognizes the role of systemic inequalities and injustices. It ties together far-reaching ideas around sustainable work and wages, unionization, universal health care, housing and trade. Democratic officials and activists are pushing the party to unify behind a plan to quickly wean the U.S. economy off fossil fuels and cement climate change as a central issue in the 2020 election.The plan, released on Thursday and dubbed the “Green New Deal,” aims to dramatically overhaul the country’s energy and transportation infrastructure to “achieve net-zero greenhouse gas emissions” in the next 10 years.